The Ace Spitfire is a new collection by Dutch brand TW Steel. It is a chronograph with the brand’s usual big and bold design style, and a Sellita SW510 movement. The brand has chosen to make the Ace Spitfire available in a pre-order window that runs until 22 July 2018, at prices around €1,000. The final retail price will be about double. The watch is large at 46 mm, and it looks like it’s fairly thick too, probably around 14 mm though they haven’t provided this information. The case is in stainless steel with a brushed finish. It has a screw-down crown that gives it a water resistance of 10 atm, 100 metres, making it an all-round sports watch. The case has some distinctive features that have become parts of the brand signature: the crown protector, which also incorporates the lower chronograph pusher which swings on a pivot at the 5 o’clock position, and a strap that combines a soft rubber lining with an exterior facing in Italian leather. The strap is linked to the case using a screwed pin that can easily be removed allowing the strap to be changed. The most iconic piece (ACE 201) has a dial with a ring of brushed steel with two rings of rivets. 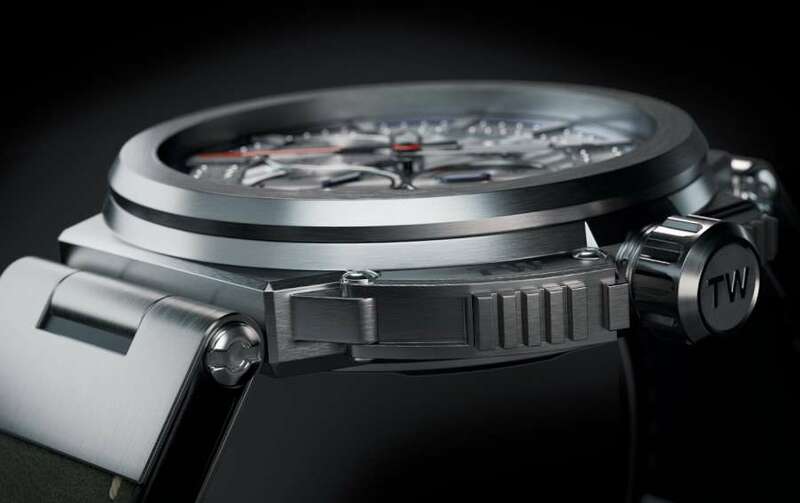 The subdials are based on cockpit instruments, and the designers have sacrificed chronograph legibility, preferring to enhance the tough image. So the big red chronograph hand has no scale on which to read the seconds (the two rings of rivets represent the scale), and the chronograph minutes subdial on the left also has no scale beyond the 5-minute divisions. The watch is an example of a trend that has become widespread in contemporary watches: chronographs that can’t be used to measure an elapsed time. To my mind it’s a curious development, but nothing scandalous: watches like this become theatrical objects, you buy them as part of your personal style, not as time-measuring tools. The watch is powered by the Sellita SW510 movement which can be seen through the sapphire glass caseback window. The movement is 30 mm in diameter and the TW Steel designers have chosen to make the window even smaller, using the extra space to create a distinctive caseback layout that includes a ring of smooth steel on which you can commission a personalized engraving of up to 24 characters. The movement has an industrial-style finish that suits the watch’s overall aesthetics, with a TW Steel oscillating weight. 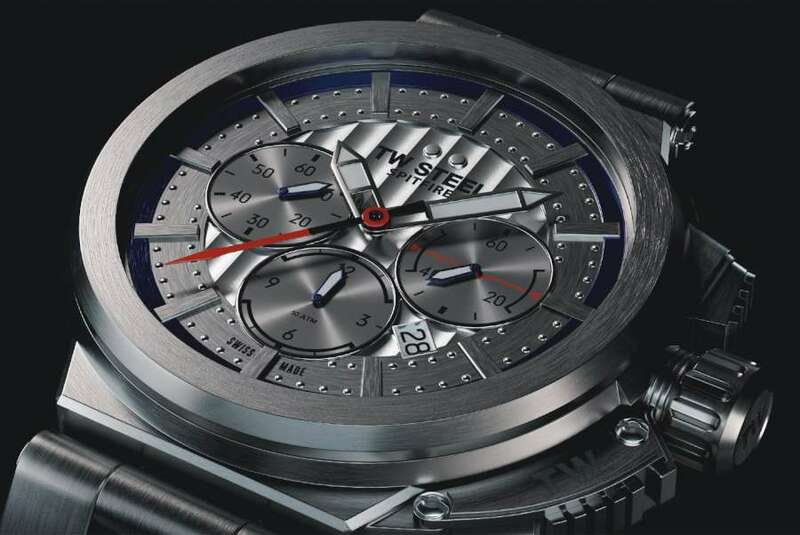 It is a cam-operated chronograph calibre based on the Valjoux 7753. Other models of the TW Steel Ace Spitfire use the Sellita SW500 movement that provides a different subdial arrangement. 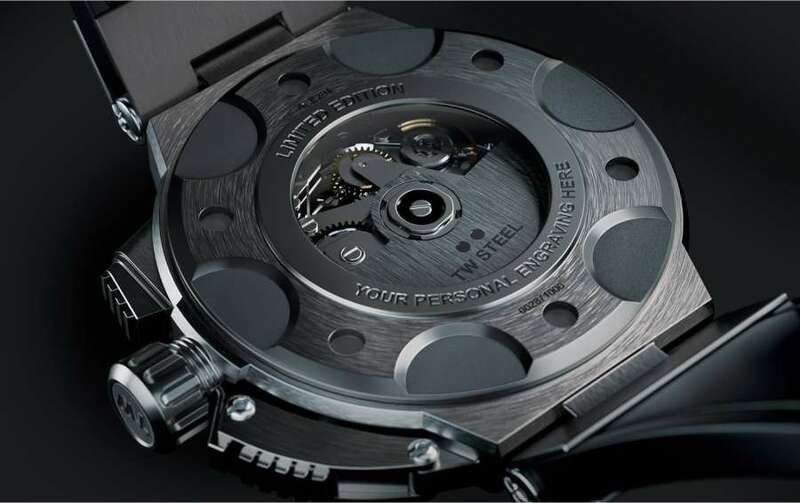 The calibre runs at 4 Hertz (28,800 vibrations per hour), it is self-winding, and provides a power reserve of 48 hours. It can be wound from the crown, and it has the stop-seconds function. 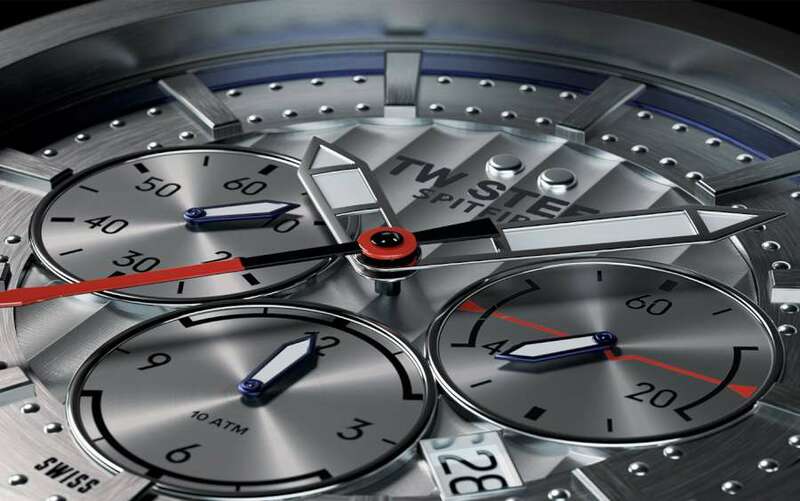 The TW Steel Ace Spitfire is a limited edition of 1,000 pieces. They are being offered with a pre-order price of around €1,000 (according to the model) until 22 July 2018, with delivery between October and November 2018. 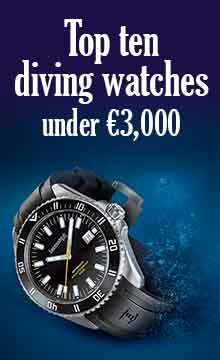 From November the watches will be available at full retail prices of just below €2,000. Read more on the TW Steel website. In the photo below, two other versions, ACE 202 and ACE 203.